With the garden at Polegate Cottage temporarily occupied by builders and tradesmen, I am experiencing an explosion in the plant population next door at The Watch House. Having cuttings, seedlings and freshly sprouted dahlias on the terrace and kitchen worktop was tolerable at first, but those tiny seedlings and cuttings are now vigorous young plants, and the dahlias are approaching 3ft tall. 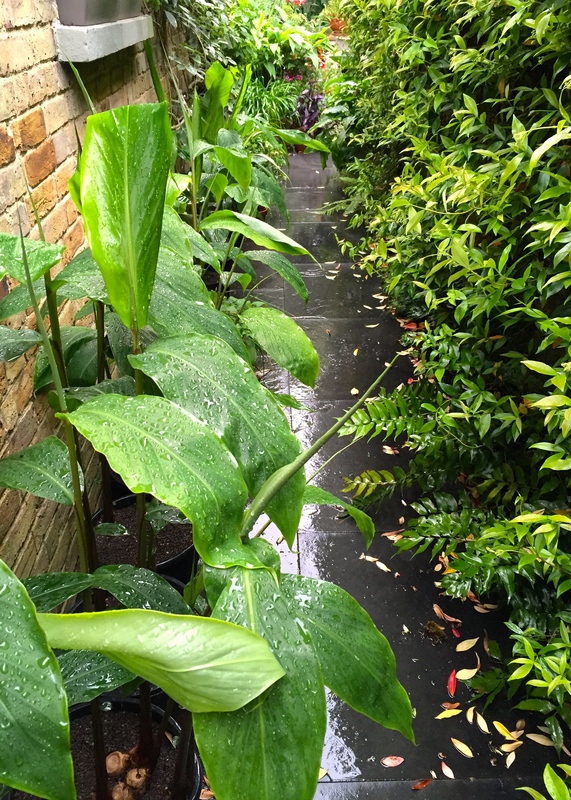 Lining the passageway that leads to our front door, there is a long procession of gingers and cannas. Robust and healthy, they are producing vast, water-channeling leaves, brilliantly adapted for soaking ones trousers every time it rains. In league with the gingers, the trachelospermum opposite is pushing further and further across the narrow path, knowing that I will not countenance removing the scented flowers that are blocking my way. The walls are, quite literally, closing in on me. Get wet for the weekend! 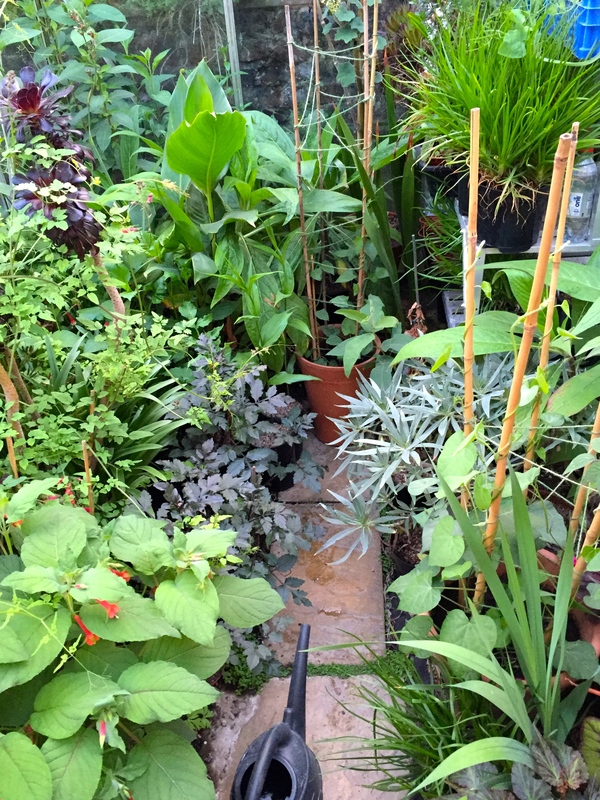 Meanwhile the contents of the greenhouse, standing remarkably intact amongst wheelbarrows of mortar and a spaghetti of old copper piping, is evolving into a lost world of gigantic leaves, exotic flowers and rampant climbers. A single seedling of Eccremocarpus scaber is starting to smother its neighbours and there are sweetpeas emerging from the roof vent. There isn’t a single pot that doesn’t have a baby Echium pininana or Geranium maderense sprouting from it; I am much too slow to pull the seedlings out. I had the brilliant idea of filling the greenhouse with Gloriosa rothschildiana during the summer, but now find I have no-where to plant them out. The luxurious orange and green flowers of Fuchsia splendens are a small consolation – never have they appeared so early or so unblemished – and now I learn one can actually eat the fruits that follow. The chaos and overcrowding displeases Him Indoors greatly. His perfect garden would have wide terraces with only sunbeds and parasols arranged on them, preferably overlooking a swimming pool. Plants might be acceptable provided they required minimal maintenance and did not create shadow. And it would be sunny from dawn until dusk. What we have now is about as far from his Nirvana as possible, plus it’s rained incessantly throughout our not-so-flaming June. It is a jungle out there and I imagine we have another month of mayhem before I have any hope of getting my overflow garden back. Of course, I should have known better. This scenario was entirely predictable and I chose to plough on regardless. Less-is-more would have been a better philosophy, rather than saddling myself with hundreds of plants that might find a home somewhere, sometime. My predicament weights all the more heavily because of the garden open weekend in August. Thank goodness this is three weeks later than usual. If the builders take any longer then we may be lending visitors scythes and machetes to penetrate a thicket of gingers, dahlias and agapanthus. My strategy now is that I need to get through this summer without being struck off by the kindly but exacting ladies from the National Gardens Scheme. In autumn I can rein in my ambition and start again with fewer pots and a simpler layout. I will make space for Him Indoors’ long awaited steamer chairs and reduce the population of the greenhouse, maybe. A few frosty nights would probably assist me with the selection process. Until then it’s standing room only. The Watch House garden is open on August 20th and 21st, 12pm-4pm, in support of the National Gardens Scheme. Sturdy boots, compass and pith helmet optional. The sun’ll come out, tomorrow…. Kind of you to say so June, but I am finding it all rather cramped at the moment. And what is it with all this rain? I’ve never known anything like it in Broadstairs, which is normally so dry. I do sympathise Dan, but seriously it’s glorious…a verdant paradise. Thank you. I might not win any design awards, but if there were a prize for leaves per inch I’d do pretty well! Will it ever stop raining Dan? What a Lovely lush oasis your yard looks hope the sun shines soon and you can buy HI his steamer chair a clear him a small space to sit!! Looks great! I do sympathise; I have the opposite problem here hundreds of potted plants and garden which seems as if it is getting bigger by the day since I can’t keep up with its watering during an unexpectedly early and a week long heat wave of 36 C’s in the shade. It seems we are going to have yet another one next week and only Goddess knows what the rest of the summer will be like. You asked before (when I commented to your question on variegated plants) and I reply now: Yes ,my garden is at the tip of the Aegean, further southeast of Bodrum, on the slopes of the Bay of Gokova. It never rains here between April and October, temperatures remain a constant 30 C’s in the shade during the days, scorching hot winds are among our most dreaded enemy. Until this June I tried all types of gingers, cannas, azaleas, hydrangea, callas, . . anything that’ ll give that tropical look; but unfortunately, finally I realised that I can not go on fighting the mother nature. Now I am gradually giving up on gingers. at the end of this season I will only keep samples of them in big pot and un-earth the rest into the compost. Anything that does not survive twice a week watering goes, is my new gardening motto, after 12 years of trying to turn this steep-slope, rocky, limey piece of land into a jungle paradise I am surrendering. However, agapanthus, all kinds of strelitizia, jacaranda, interestingly lisianthus, some fern, gaura and of course most silver-grey-blues besides all cactus are happy with that schedule. I read your blog and many more from similar to mine or your climate gardeners and each time I see a lush green garden photo, how I envy and wish I had a garden in such similar climate which I did for a period of 8 years in Buenos Aires hence I tried all the ones I have had there in this garden. It simply does not work, especially when one tries to be ethical on water conservation. What a dilemma, no? Paradise is not necessarily a lush tropical jungle, so I am learning. What is the name of the plant in the 4th photo, on the right centre, behind the morning glory and its canes, the blue/silvery leaved one? Any blue/silver is my new mania, would much appreciated if you can give some info on it, can it be grown from seeds? Can I get hold of its seeds online? Hi Ceylan. You are very wise to give up on fighting nature. It’s an affliction many gardeners find hard to shake off. In England we are always trying to grow things that are not quite frost hardy, which can be just as disappointing as trying to grow tropicals on the shores of the Med. Happily it sound like lots of lovely things will flourish in place of the thirsty plants. Thank you for E. candicans info & supportive words. Here is a link to Australian Plant Society have a read and you might find something interesting. Just try to stick to WA plants not from the East side of the country as the climate is different there. Lots more rain and humidity. Great advice Barbara, thank you and have a lovely weekend! Thank you Barbara for your respond, advise & links. Both links are most resourceful. Certainly will look for Kangaroo’s paw seeds! I already have dianella Tasmanica (from BuenosAires); I try to avoid grasses not to provide more hiding place to viper; bushes are pruned from below up so that I can see, hopefully before the dogs and put them indoors till the creeping creature goes back to where it came from. Heat, fires, vipers, wind, boars and more, gardening is a real challenge for us. All sounds a bit too exciting Ceylan! All I can boast is slugs, snails, foxes and vine weevils. A bit of heat would not go amiss right now though 🙂 I didn’t do so well with Dianella tasmanica. It slowly died out in my garden. Those purple fruits are fabulous. Looks fabulous, although I sympathise about the soggy trousers! This is my first time reading your big and I’ve thoroughly enjoyed it. Good luck with the NGS, Nicola. Oh also meant to say do pot up the seedlings of echium and geraniums that are sprouting out and sell them at your garden open day? There just given you more work!!! Thanks Anne, just what I needed. The problem is finding the space to grow them on! I don’t suppose the house next door is for sale…!!?? Any time Judy, any time. I like the jungly effect, but there are limits!! A wonderful use of limited space. 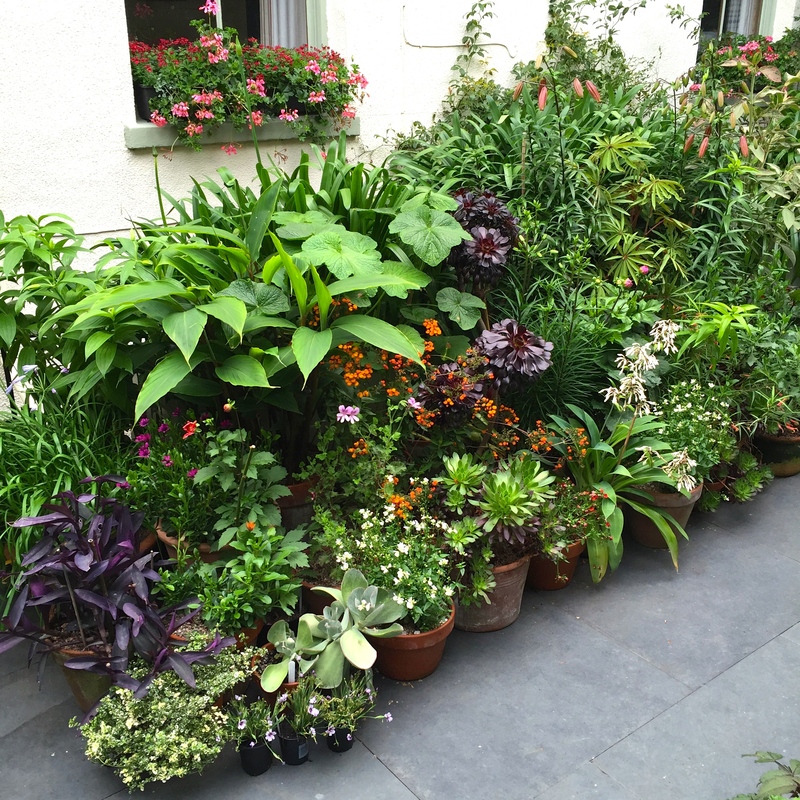 It can be tricky at times to grow plants successfully in Blightly but you’ve done a fab job here! 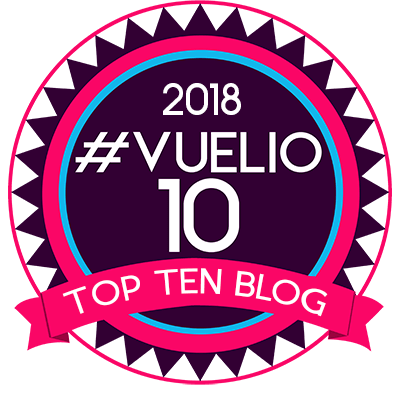 I’m going to have a better read of your blog later as I think I can relate to the frustration, living in the UK myself. Thanks Dave. Hope you enjoy delving a bit deeper into The Frustrated Gardener. I’d love to hear what you think of other posts. Have a super weekend. In addition to being a time-poor plantsman, I see you are also a space-poor one right now, the fate of many a plant lover. But when I have too may pots, they end up looking neglected and a bit tortured from being cared for by a gardener stretched too thin. Your plants, however, look gorgeous! We had record rains in Virginia in May, so I can sypathize with you getting too much. It does make for lush growth but one does get tired of being sodden every time one steps outside. Best of luck in the renovations and preparing for the open house! Thank you. Very kind. I am my own worst enemy when it comes to the garden. I make it hard work and don’t know when to say “enough!”. I heard about your extraordinary rainfall and hope you enjoy a drier summer. For some, more rain in Virginia must be an ominous prospect. Have to say it all looks wonderfully lush and verdant. Hard work for you maybe but fabulous for us to look on and enjoy. 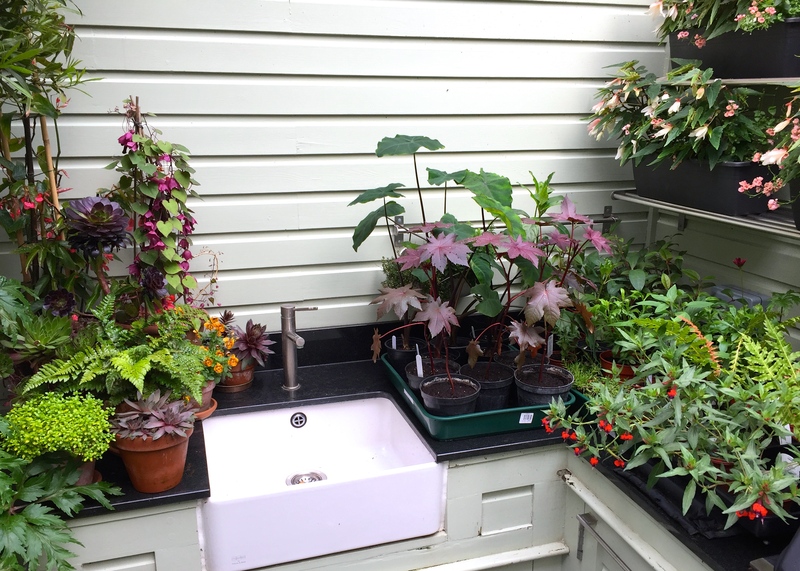 Can I ask, in the 5th photo down to the left of the kitchen sink, what is the vine at the rear with the purplish flowers? Just wondering if it might be a bleeding heart? If so, I’ve recently bought one and hoping mine will look as good in time. Also, loving the trays of begonia’s (?) with diascia (?) to the right. You are looking at Rhodochiton atrosanguineus Anne, the purple bell vine. Very easy to grow from seed and quite a showstopper. 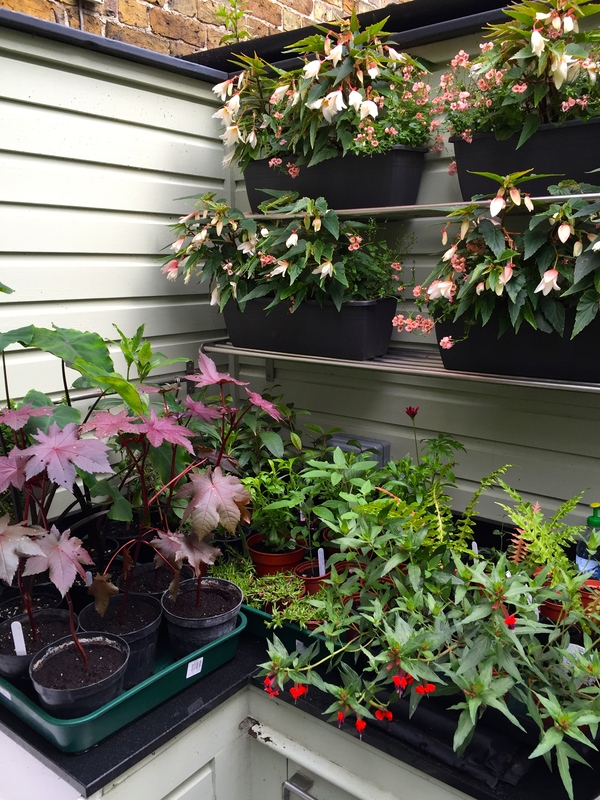 And, yes, you can see begonias and diascias planted out on the shelves. The diascias have hated all the wet weather and some have rotted away sadly, but the begonias have no problem filling the space. Gardening gives a lot of happiness. Seeing the plants grow gives lot of happiness. The plants are very good and it creates a good atmosphere and brings in good vibrations. Thank you Satya. You’ve introduced the Beach Boys song “Good Vibrations” into my head on this lovely summer morning 🤓 I am singing it on my way to work. Yes, you are right. Him Indoors considers plants that bear fruit and vegetables more precious than flowers, but I am very much more attracted to flowering plants at this stage in my life. Gardening is the best thing one can do. Some people don’t go on vacations because they have to water the plant. Such is the connection between the people and plants. Thanks for the article. You are welcome. I am one of those people who have an issue with leaving my plants untended. I have been known to return home for a night just to check they are OK.